Just a garden wall, with corbel at top. 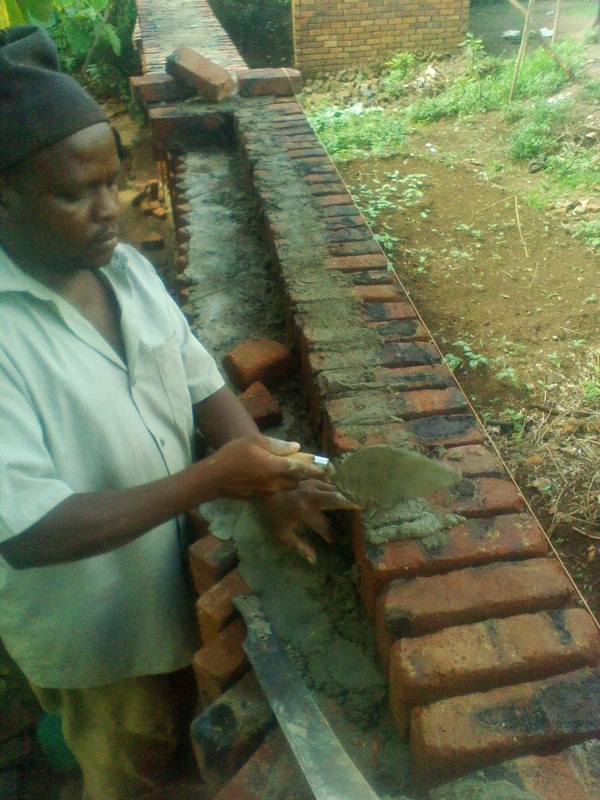 As I have a clay brick factory I often have "reject" bricks , like these under burnt/salmon/soft bricks in the wall below and over burnt and misshapen bricks in 2nd picture. Here is a project using both. I am about to rent the groined house, and an employee of the United Nations was interested but their security ruled it out as the thorn hedge had no chain link in it. So i decided to try a 2m garden wall with a masonry cap. 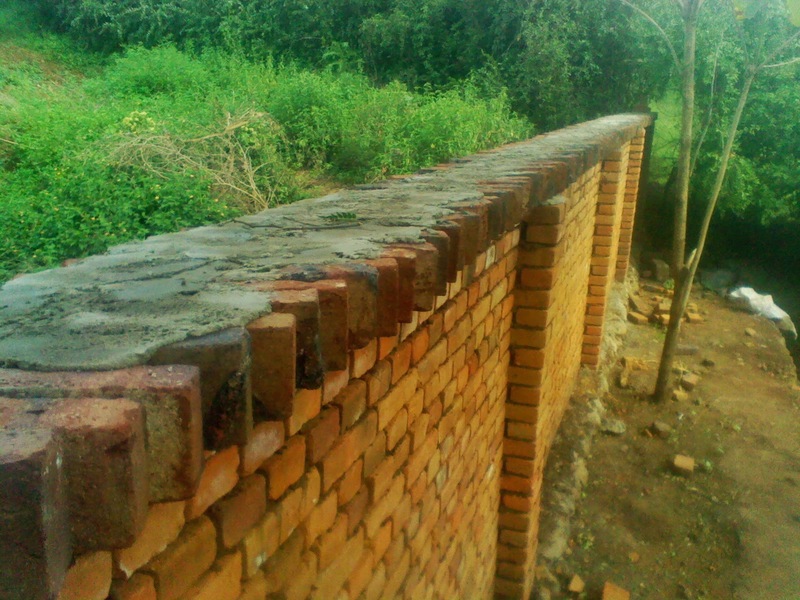 We had a brick kiln go bad so we had many salmon bricks and made this wall. footings then stones to get me above ground , then clay mortar up 170cm. columns every 3 meters. What do you do with this junk below? You bang and chop on it and get a reasonably shaped clinker. I want over burnt for the overhang for strength and water proofing. These clinkers are laid at about 45degrees in rowlock bond. We had to do the angle otherwise the overhang would be 1/2 instead of 1/3. Dickson putting on second corbel this time straight rowlock. 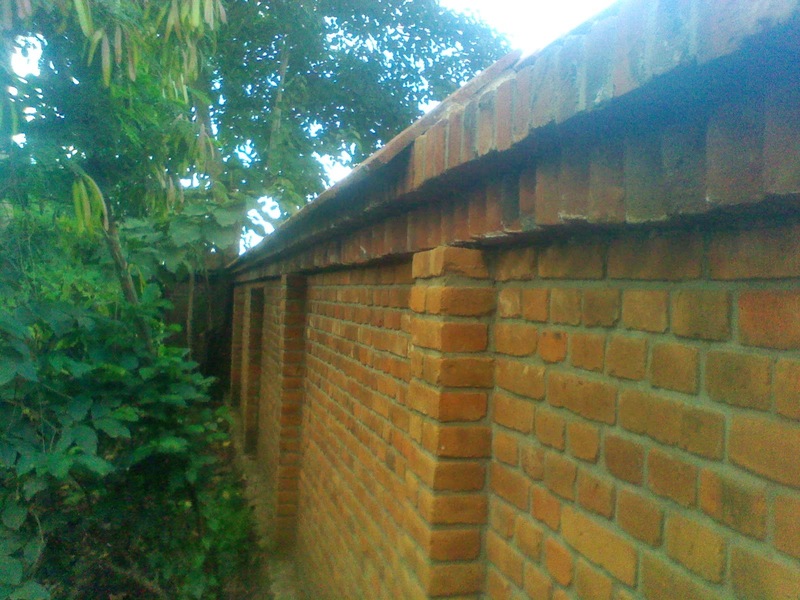 finished wall with half way putting on thin brick "tiles". Very little rain is getting on this wall. looking from another angle. The pointing makes a big difference in the appearance from the first picture. I have always been negative about perimeter walls. They feel like prison walls. With this wall i changed my mind. This takes so much less space than thorn bush hedges, and there is no upkeep. Bernice is now wanting places to hang flowers. It has taken awhile to sand the floor smooth. Or to the point it is "good enough". I put three coats of two pack Polyurethane gloss. Here is more pictures than you need. These first four pictures are after the first weak coat of polyurethane. I put the same on the brick steps. With both I don't really like the gloss as opposed to matt, but i can only get floor polyurethane in gloss. And the rest after the third coat. I wish I could take when there is no glare. close up to attest to the few gaps.